18.687 FPC 258 Summer Street - Sidewalk: Replace an existing light pole with a new light pole that includes telecommunication equipment within its base and an antenna attached at the top. 17.247 FPC 27-43 Wormwood Street: Repair existing smokestack and modify existing wireless communications facility. 18.689 FPC 25 Thomson Place: At front façade install wall signage and sidewalk patio dining area; and install rooftop mechanical equipment. Climate Ready Boston is the Mayor's ongoing initiative to help the City grow and prosper in the face of climate change. Protecting South Boston from coastal flooding is a high priority. 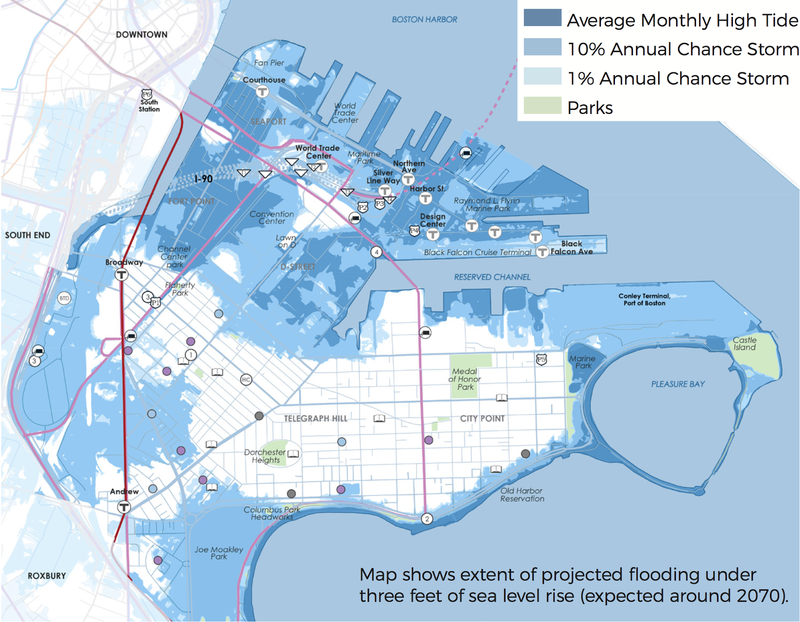 In March 2016, FEMA released new flood maps, which put most of the Fort Point neighborhood in the high risk flood zone. Through the Climate Ready South Boston project, the City is working to better understand current and future flood risks in South Boston, and develop strategies to protect the neighborhood. If you haven't yet completed the Climate Ready South Boston Survey, click here. Drop by Climate Change South Boston Open House on Monday, December 11th to learn more about climate resiliency and our neighborhood. Come meet your neighbors and enjoy an evening filled with great raffle prizes, hot appetizers, cash bar and a short performance by members of the Boys & Girls Club at 7 pm. Transportation available via Southie Shuttle. Look no longer and look no further than your own backyard to get in the holiday spirit. 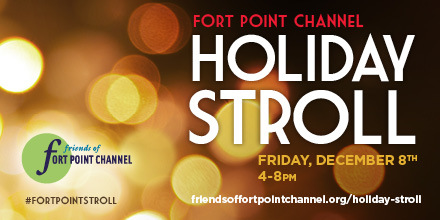 The seventh annual Fort Point Holiday Stroll, hosted by the Friends of The Fort Point Channel, is Friday, December 8, 2017 from 4 pm - 7 pm. 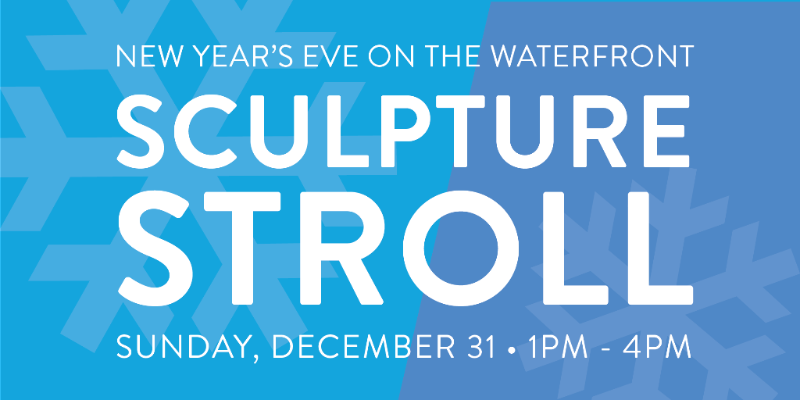 Click here to register and start planning your stroll. You may pick up the Fort Point Holiday Stroll map at the Atrium at the Residence Inn by Marriott located at 370 Congress Street or at any participating business. Be sure to collect stamps at every stop for a chance to win prizes from local businesses and restaurants. At the end of the night rest those weary feet at a free screening of the Fort Point Theatre Channel's We Are Egypt at 7:30 pm at Midway Artist Studios. Return this weekend for more shopping at the 249 A Street Holiday Studio Sale on Saturday 12 pm to 5 pm, and Holiday Pop Ups at the fpac space Saturday and Sunday 12 pm - 6 pm and at Row 34 on Sunday from 4 pm - 6 pm. 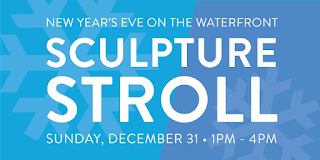 For more information read our previous post, It's Time To Put On Your Holiday Walking Shoes. • Lynn Smiledge and David Berarducci, reappointed as members of the Boston Landmarks Commission for a term expiring June 30, 2020*. • Kirsten Hoffman and Felicia Jacques, reappointed as members of the Bosotn Landmarks Commission for a term expiring June 30, 2019. • Diana Parcon, reappointed as an alternate member of the Boston Landmarks Commission for a term expiring June 30, 2019. • John Karoff, reappointed as member of the Fort Point Channel Landmark District Commission for a term expiring May 1, 2020. * Also serve on the Fort Point Channl Landmark District Commission. Community Preservation Committee: The Mayor submitted an order to appropriate just over $285,000 for the administrative and operating expenses of the Community Preservation Committee (CPC) for FY 2018 (July 1, 2017 through June 30, 2018). The order also included appropriations of $17.9M from the Community Preservation Fund annual revenues for appropriation upon the recommendations of the CPC. The order was assigned to the Committee on Ways and Means. Boston Arts Academy: The Council voted unanimously to support a $123M appropriation for the construction of a new facility for the Boston Arts Academy, located on the existing site at 174 Ipswich. Because this is a capital appropriation, there are two votes required at least two weeks apart with a 2/3 majority. The matter is now assigned for further action. Raymond Flynn Marine Park PILOT Agreement: The Mayor gave notice to the Council of a PILOT agreement that the City reached with the Economic Development and Industrial Corporation of Boston (EDIC), the owners of Parcel R in the Raymond Flynn Industrial Park. Instead of being subject to taxes between now and Fiscal Year 2025, the developers will pay $100,000 for FY 2018, $400,000 for FY 2019, and thereafter a rate per square foot on the construction that has been completed, starting with $6 in 2020 and increasing to $10 in 2024. If construction has not begun by FY 2020, the site will be subject to taxes. A $13.8M grant from the U.S. Department of Homeland Security, passed through the MA Executive Office of Public Safety and Security, to be administered by the Mayor’s Office of Emergency Management. The grant will fund the continued support of planning, exercises, trainings, and operational needs, that will assist in building enhanced and sustainable security capacities to help prevent, respond to and recover from threats or acts of terrorism, including chemical, biological, radiological, nuclear and explosive incidents. A $628,365 grant from the Federal Emergency Management Agency (FEMA) for the Boston Fire Department to fund pre-fabricated fire props to train firefights on wind-driven fires; mid and hi-rise operations; plus expenses for a 4 day driver training program that will bring the BFD into compliance with National Fire Protection Association standards. A $200,000 grant for the Beta Blocks grant from the John S. and James L. Knight Foundation to be administered by the Mayor’s office for experiments that support Boston’s efforts to create a process for deploying sensors in urban environments. A $179,000 grant from the Massachusetts Cultural Council for the FY18 Local Culture Council program, administered by the Office of Arts and Culture. The grants fund sub-awards for arts, humanities and science related programming. A $100,000 grant from the Rockefeller Foundation to be administered by the Mayor’s Office to fund the cost of researching and planning an Economic Mobility Lab to advance economic mobility and security for lower and lower-middle class Bostonians. A $69,975 grant from FEMA to fund a consultant to update the functional needs of specific populations and neighborhoods into all aspects of the City of Boston Emergency Management Program. A donation of 3 bicycles for use by the District C-6 of the Boston Police Department. Plastic Bag Ban: The Council voted unanimously to approve the ordinance sponsored by Councilor O’Malley and me to reduce plastic bag waste in Boston (Councilor Jackson was not at the meeting and therefore couldn’t vote, but he did send in a letter of support that was read into the record). This legislation would ban single-use plastic checkout bags; retail establishments in the City would be required to offer only recyclable, reusable, or compostable bags at checkout with a minimum 5-cent fee that would incentivize customers to bring their own reusable bags. Plastic bags are created using petroleum, increasing our dependence on fossil fuels. As Councilor O’Malley noted in his remarks, approximately 370 million single-use plastic bags will be used in Boston this year alone, most for a matter of seconds before ending up as litter in countless parks, streets, and neighborhoods. Taxpayers are already paying for these bags, from cleanup costs and the price of our recycling contractor removing 20 tons of plastic bags each month from their equipment all of which are paid for with taxpayer dollars, to the long-term costs of climate change and degradation that we are paying and our children will pay for years to come. The measure now goes to Mayor Walsh for his signature or veto. Recreational Marijuana Tax: The Mayor submitted an order for Boston to opt into the municipal sales tax on recreational marijuana at the maximum amount allowed by state law. The order would have the City of Boston accept the provision of Section 3 of Chapter 64N of the General Laws – allowing us to impose the sales tax – and it would set that sales tax at the maximum of 3 percent. The matter was assigned to the Government Operations Committee for a hearing.